The “Independence Day” sequel is filming in the Albuquerque area and is looking to cast talent to portray area 51 soldiers for multiple work dates this month, July and August. OLC is looking for talent that has a very open and flexible schedule that will allow them to work 10+ days and attend wardrobe fittings next week in Albuquerque. 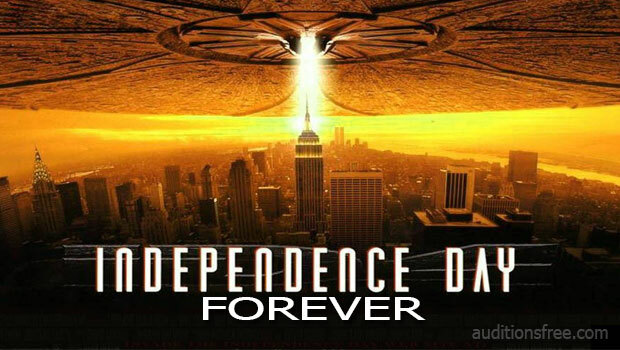 “Independence Day 2“, being called “Independence Day Forever” and will be split into 2 films. “Independence Day Forever Part 1” is filming now. According to the film’s IMDB page, ID2 has a huge budget of $200,000,000. “Independence Day 2: Independence Day Forever” will see much of the original cast reunite. Jeff Goldblum, Vivica A. Fox and Bill Pullman are all returning for the sequel. Also starring in the “Independence Day” sequel are Charlotte Gainsbourg, Liam Hemsworth, Travis Tope and Jessie Usher. Chris Hemsworth’s brother, Liam Hemsworth will be replacing Will Smith as the new lead. “Independence Day 2“ is set to hit the movie theaters in the summer of 2016. ALBUQUERQUE, NM Casting Notice – Feature Film “Independence Day 2” for work on THURSDAY 6/25/15, FRIDAY 6/26/15 -AND- MONDAY 6/29/15. **MUST be available on ALL dates – NO EXCEPTIONS! MUST also be available for a possible wardrobe fitting on either Tues 6/23 or Weds 6/24. We do not have call/wrap times so you would need to be fully 100% available on each work date. You MUST have open/flexible availability if submitting so that you can work WHATEVER the call times & wrap times end up being. LOOKING FOR FLEXIBLE AND EAGER PEOPLE WHO WANT TO BE A Reliable MAJOR PART OF THIS FILM – If not, please DO NOT SUBMIT! Pay rate for EXTRAS is $72.00 for 8 hours ($9.00/hour with a 8 hour guarantee). Overtime will be paid after 8 hours. You will receive a check in the mail usually 10-14 business days AFTER you work. NEW MEXICO LOCAL HIRE ONLY! AREA 51 SOLDIERS: male and female, all ethnicities, age range 18-45, clean-cut, conservative, short hair or willing to let us give you a military haircut, fit, athletic, prefer those who have some previous military or law enforcement experience (although not required) or knowledge of safe firearms handling. NO VISIBLE Tattoes on hands or neck!! No piercings or gauges. MONDAY 6/22/15 -AND- TUESDAY 6/23/15. MUST be available on BOTH dates – NO EXCEPTIONS! MUST also be available with a flexible schedule for additional dated (TBD) throughout July & August. We do not have call/wrap times so you would need to be fully 100% available on each work date. You MUST have open/flexible availability if submitting so that you can work WHATEVER the call times & wrap times end up being. LOOKING FOR FLEXIBLE AND EAGER PEOPLE WHO WANT TO BE A Reliable MAJOR PART OF THIS FILM!!! If not, please DO NOT SUBMIT! FEATURED EXTRAS: – NEW MEXICO LOCAL HIRE ONLY! FIGHTER PILOTS: male, all ethnicities, age range 19-25, 6’0″-6’5″, clean-cut, conservative, short hair or willing to let us give you a military haircut, fit, athletic, good looking, confident, cocky, in great physical shape. Previous military or law enforcement experience helpful but not required. NO VISIBLE Tattoes on hands or neck!! No piercings or gauges. You will be a part of the Dylan Squadron (the guy who is playing the role of Will Smith’s son forn the first “ID” film) so will be featured in all scenes that Dylan works in. PLEASE DO NOT send more than one email! PLEASE DO NOT email if you don’t fit these casting requirements or are not available on the listed work date!